The Franklin Institute’s Science After Hours is a night of science fun for 21+ adults. 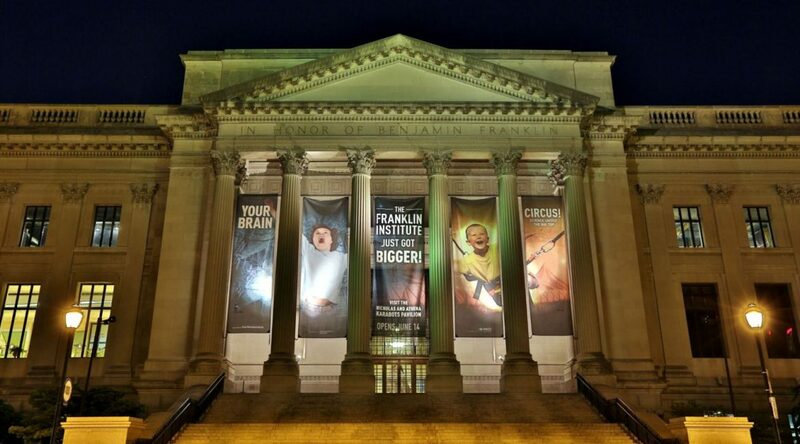 The Franklin Institute has been a Philadelphia Staple since its founding in 1824. Its countless hands-on science and technology exhibits have been drawing in crowds for decades upon decades, and its playful, interactive nature is especially appealing for families and children. However, in 2014 the Institute began a new initiative called “Science After Hours”, a night time science extravaganza featuring experiments, demonstrations, games, and science phenomenon for adults 21 and over. And as you may expect, the 21+ rule is due to the fact that there are multiple cash bars serving alcohol at these events. That’s right folks. Your dreams of exploring your favorite science museum with an un-disguised drink in hand have now come true. Are you sold yet? If not, we at Geno’s have put together a review of the Franklin Institute’s Science After Hours Program so that you can get as excited as we are. The Franklin Institute’s Science After Hours program takes place once a month, and regular tickets are just $15. Each night has its own theme, from cocktail concocting to time traveling to wizard schools, so that you can attend multiple times and see something new! This year they have done themes such as Speakeasy Science, Seven Deadly Sins, Nerd Olympics, and Treasure Hunt to name a few. In the past, After Hours nights have featured fire breathers, sword swallowers, booze catapults, marshmallow and rum induced with liquid nitrogen, and countless other fun, interesting games, exhibits, live performances, and challenges for adults. This program is the perfect combination of fun and educational, and encourages adults to tap into their imagination. You will also have access to the regular Franklin Institute exhibits as well, meaning yes, you can chug a drink while walking through the Giant Heart. You can have a cocktail in the train room and explore outer space with a beer. What a perfect combination! Don’t miss out on a chance to attend a great alternative night out with your friends and coworkers! After your night of science, adventure and fun, make sure to stop by Geno’s and tell us all about it while chowing down on your favorite steak sandwich. We’ll be here waiting for you! Wednesdays just became your favorite day thanks to Center City Sips Happy Hour.